Jackpot Capital Casino (http://www.jackpotcapital.eu) has just begun another massive casino bonus giveaway. This time it's a Ghost Hunt that will give players a total of $100,000 in free money! All you have to do is play and you'll earn points. You'll be ranked by your points and you'll get a bonus based on how much you've played. Daily or occasional player -- there are four levels and players at each level will win bonuses so everyone has a chance to benefit. Every week until November 17 hundreds of players will receive up to $500 each based on scoreboard rank. Every week another $2560 will be randomly awarded -- just logon and you can win! 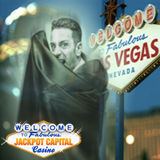 With Jackpot Capital Casino has hundreds of games in it's online casino and many of its most popular games are also available in its mobile casino for Apple and Android phones and tablets (m.jackpotcapital.eu in a mobile browser).